Green is the color of abundance, wealth and prosperity. Although neutral colors, such as white, gray, or muted brown, are usually used to give modern interiors a stylish look, color accents are becoming increasingly popular. In many cases, the difference between the most ordinary, uninhabited house and what seems attractive and warm lies in a light kiss of color in an elegant and delicate form. 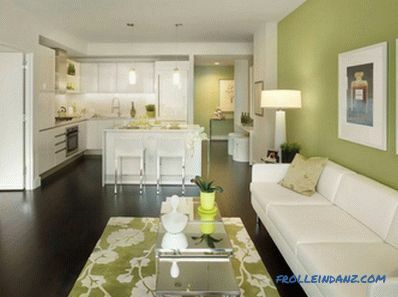 Green is one of the contrasting colors that really fits well with tasteful, modern interiors. Green has such universal shades that it is usually easy to choose the right one. Green is a color that is an integral part of nature, so we take it as a part of our house much more easily than many other colors. 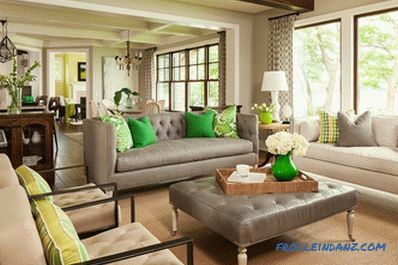 Here are some inspirational ideas that should help you choose the right shade of green as a color accent. 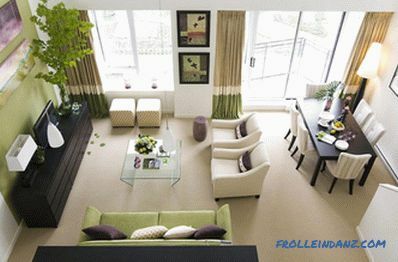 Elegant, modern living room with various shades of green evenly distributed throughout the room. Photo courtesy of Daniel Sheehan. 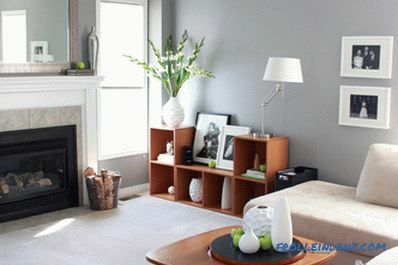 Fruits, plants and vases naturally and naturally add green to this living room in neutral colors. 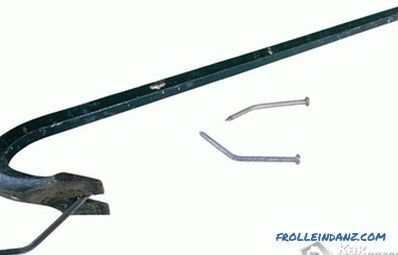 Photo courtesy of Leclair Décor. 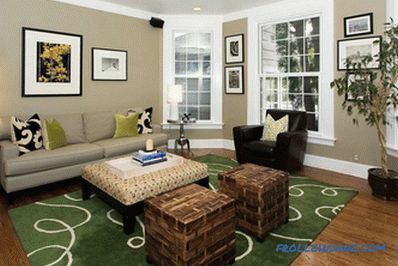 Gray living room with soft splashes of yellow and green. Photo courtesy of Found Design. 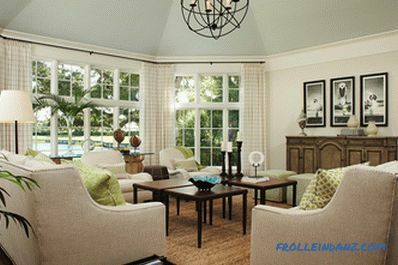 The interior of the room in green can be soothing and relaxing, provided that the shade is correct. Photo courtesy of the Gacek Design Group. Modern kitchen in which design delicate shades of light lemon-green color are used. The use of a color accent in more than one place creates a feeling of inner balance. Photo courtesy of Prestige Builders. A contrast wall is still the most popular way to add color to a modern interior. Photo courtesy of Panache Interiors. Photo courtesy of Intexure Architects. 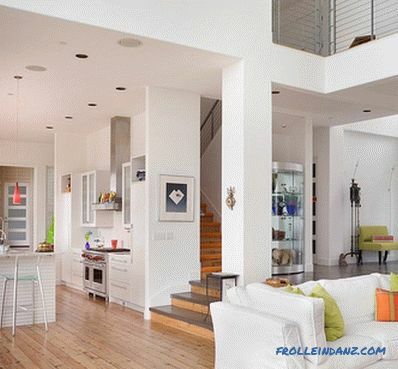 A modern living room in white and gray with a houseplant as a contrasting green spot. Apple-green decor on the general light background of the living room. 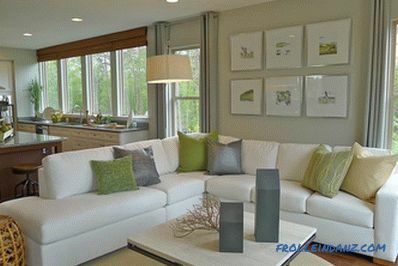 Green is relatively rarely used as a color accent in living rooms. 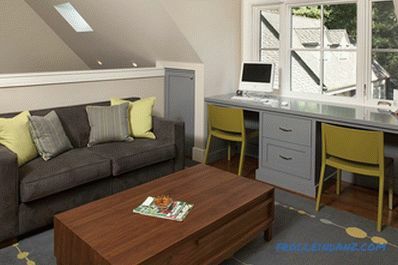 To paint one of the walls in a contrasting green shade is not the only way to bring color into the interior. Contrast fabrics can serve as the easiest and aesthetic option in this regard. Beautiful light green curtains and sofa cushions, an apple-green photo frame or even a houseplant in the corner will help you to break free from the monotony of a neutral background. Or you can just put a glass vase of a suitable shade - it is even better and simpler. 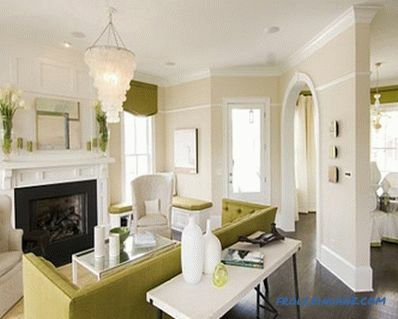 Curtains and sofa, combined with a contrasting wall in the color of light green moss. Green and blue colors, used together with white and gray, give the owners of this living room a cheerful mood. Photo courtesy of Tara Bussema. Soothing shades of blue combined with stylish green accents. Photo courtesy of KannCept Design. Let the natural greenery outside also become part of your interior. Photo courtesy of L K DeFrances. Associates. When designing a room and choosing a color scheme, the best option is to follow the inspiration that nature gives us. And here green is out of competition. In this aspect, it compares favorably with other colors, is the leader among them. 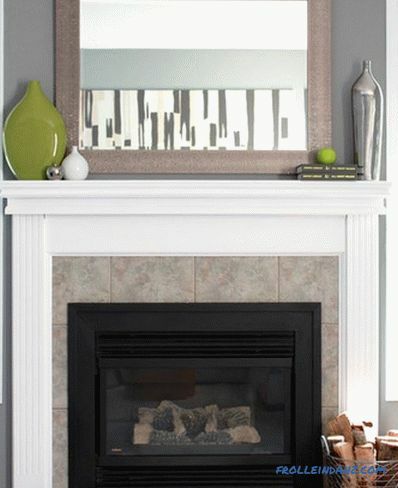 Accessories and décor are an excellent way to bring color into the interior! Photo courtesy of Tobi Fairley Interior Design. A green sofa and lovely turquoise cushions provide a contrast of shades. Photo courtesy of Niki Papadopoulos. Different shades of green in the interior of this room are organically combined into a single whole. Photo courtesy of Martha O'Hara Interiors. 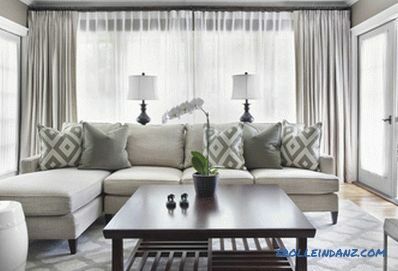 The contrasting green color of the chair and pillows gives this room freshness in neutral colors. 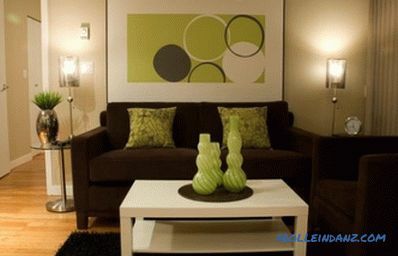 Notice how the green lime in the paintings is complemented by the green of the cushions. Photo courtesy of Carlyn And Company Interiors + Design. 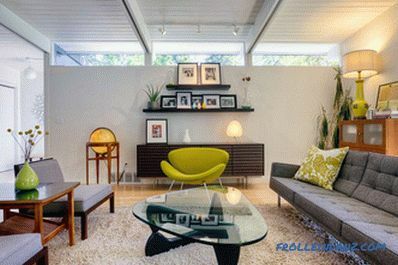 Green furniture does not seem to be an alien element in the classic interior of this living room. Photo courtesy of J. Hettinger Interiors. 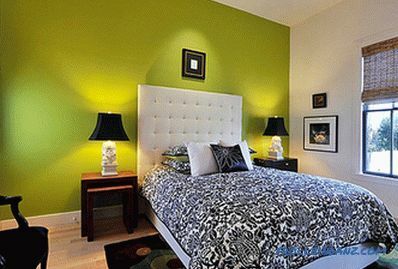 Green accents seem much more attractive with the right lighting. Photo courtesy of Heather Kleim. Yellow-green accents - sophisticated and sophisticated and ultramodern at the same time. Photo courtesy of Anderson Design Studio. With what the green color in the interior is combined not just well, but excellent, because it is orange. Photo courtesy of Alan Mascord Design Associates. 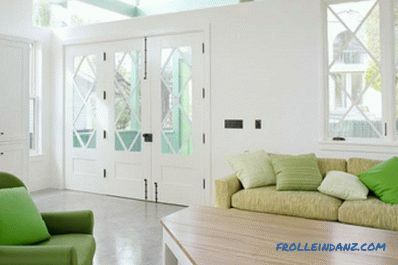 As we said above, adding green to the interior is a very fashionable trend. 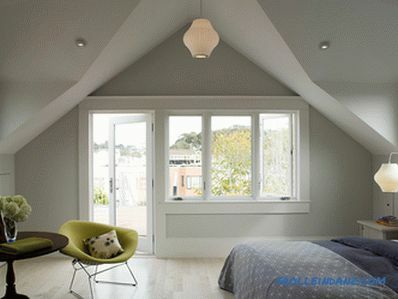 As some subtle shades of this color create a soothing atmosphere, they are a good choice for the bedroom. 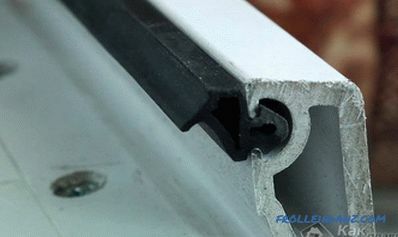 But stay away from dark and bright colors, making out the interior of the resting place. Remember that the more neutral the background you choose, the greater the effect of color accents. 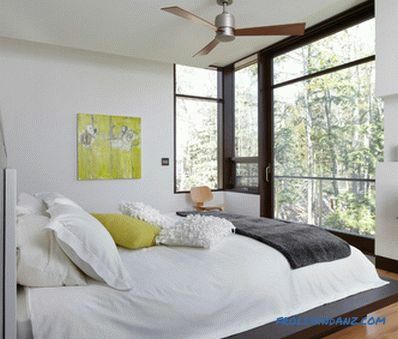 If you want to create a unique bedroom, think about mixing two contrasting colors. Surprisingly, orange and purple are combined with various shades of green. A bedroom with a beautiful green headboard and lots of natural greenery. Photo courtesy of ON Design Architects. 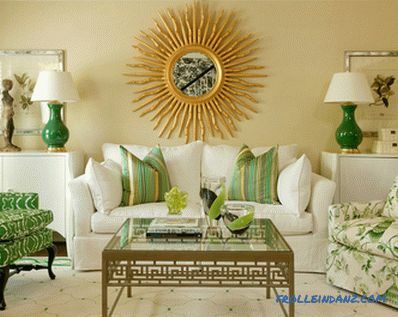 You can add green accents to a room without repair work in it using decor and furniture. Delicate use is a light green tint in the bedroom. Photo courtesy of Maria Killam. The Bertoia Diamond armchair adds greenness to this gray bedroom. The green print on the pillow overshadows all other colors. Photo courtesy of Mark Pinkerton / Vi360 photography. The bedroom is in black and white with green fabric accents. Photo courtesy of Nico van der Meulen Architects. 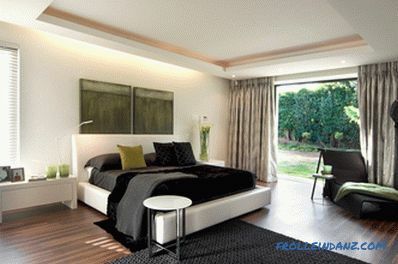 A perfect example of using contrasting fabrics in a bedroom. Photo courtesy of Crisp Architects. 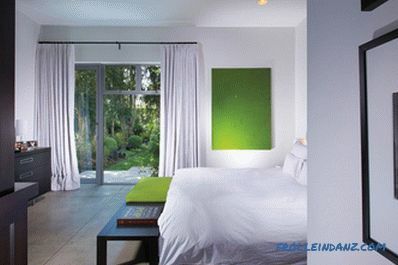 Simple additions to the lime green color stand out perfectly due to the muted interior background. 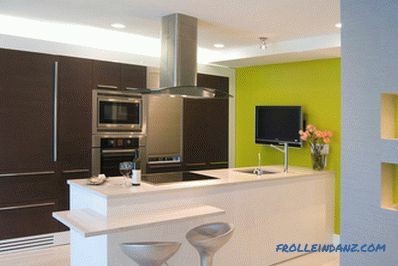 One of the most popular color trends is to use green in the bathroom and in the kitchen. Not that we discourage you from making it an integral part of other rooms in your house! But remember that there is a clear distinction between the kitchen, where green is becoming comprehensive, and other rooms that use it only as an accent. 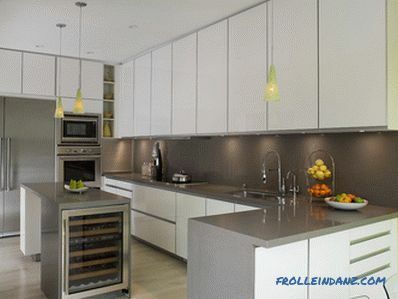 Many manufacturers of modern kitchen furniture offer shaker-style cabinets that come in various shades of green. On a pristine white background, they look very bright. For those who are not in favor of extravagance, you can find a simpler solution: one or two pots of potted plants and a few green apples will be an excellent addition to the kitchen in muted tones. 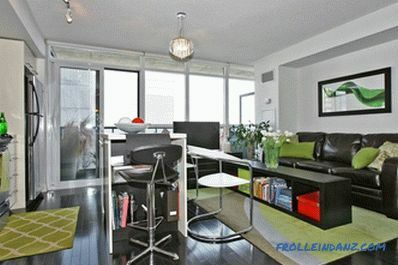 Amazing combination of green in the interior with natural greenery outside the window! 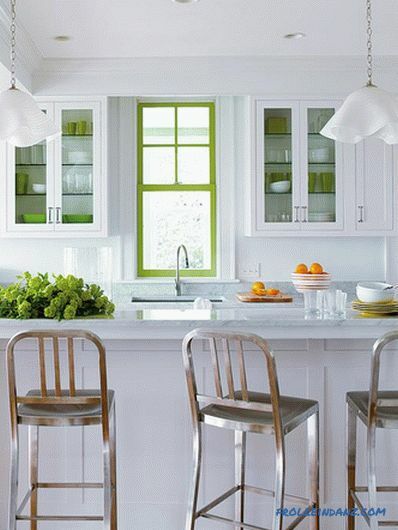 Utensils, painted window frame and fresh vegetables gently add green color to the interior of the kitchen. Photo courtesy of Vendome Press. 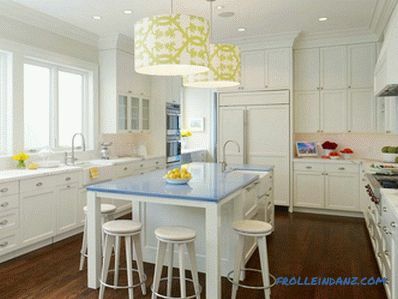 Pendant lights above the island kitchen table and fresh green-bringing apples. 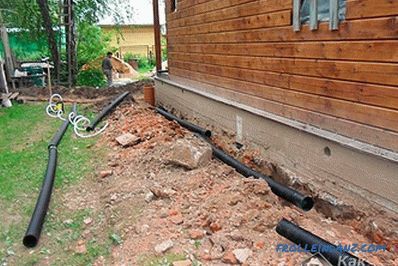 Photo courtesy of Matarozzi Pelsinger Builders. Green is the primary color in the world, it is from it that the beauty of nature arises. 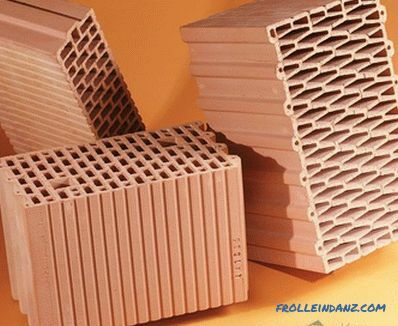 In combination with natural textures and organic elements, it is ideal for modern kitchen space. 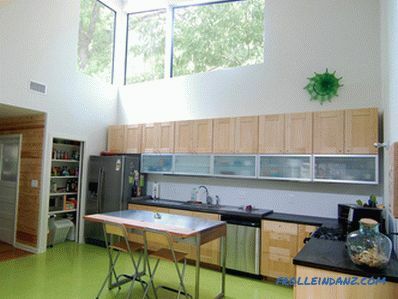 Glossy green floors are a unique way to add color to a kitchen. Photo courtesy of the Merzbau Design Collective. 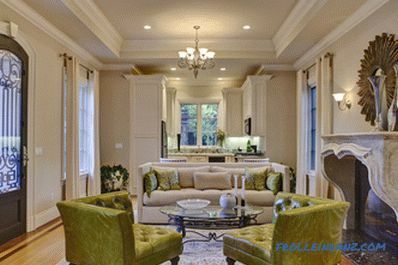 The green color of the wall niches makes bright appeal even a neutral space. Photo courtesy of NOA Architecture Planning Interiors. Green LED lighting is used as a source of contrasting color in the living room and kitchen combined into a single space. Photo courtesy of BJ Armstrong Custom Homes. Stylish pendant lights are the perfect way to add color to the kitchen. Potted plants on the dining table and sofa cushions are used to add subtle touches of green. 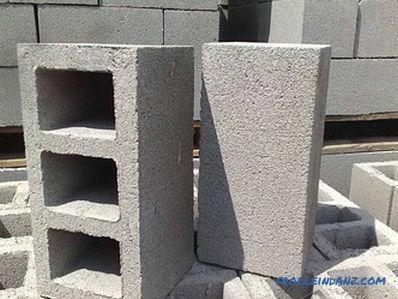 Photo courtesy of Sabal Homes. A beautiful yellow-green wall turns the staircase into a stylish sculpture that instantly attracts attention. Photo courtesy of Chelsea Atelier Architect. High green branches in a glass vase become a focal point of space. Photo courtesy of MusaDesign Interior Design. The bathroom, the dining area and the living room are the best to add a little green. In the bathroom, green looks especially tempting. You can use it as your main tile color. If you are not happy with the thought of having to do repairs again, then simply add gorgeous green towels to the white bathroom, and you will feel the difference almost instantly. And although green can be added in a variety of ways, from painting to decoration, plants are still the best and perhaps the most popular option for this! 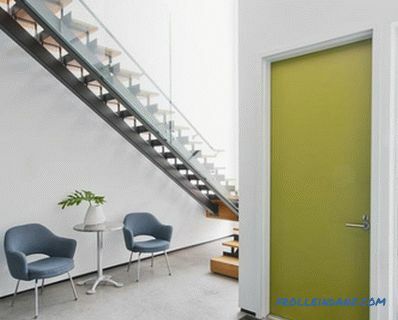 Add brightness entrance hall with a green door that stands out against a neutral background. Photo courtesy of Feldman Architecture. 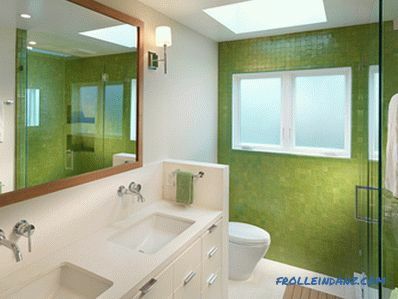 Mirrors and the green color of the walls in the bathroom interior underline its attractiveness. Photo courtesy of Rossington Architecture. The embossed green mat literally attracts attention. Photo courtesy of Amoroso Design. 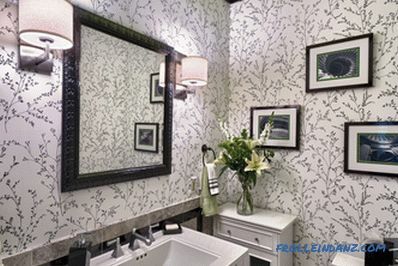 Thanks to the light touch of green, a breath of freshness is felt in the white bathroom. Photo courtesy of Divine Kitchens. 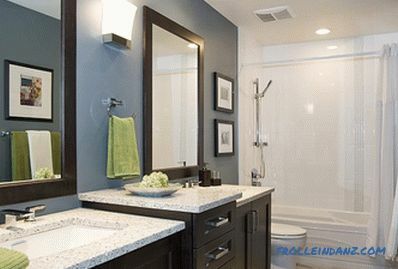 You can change the color accents in the bathroom just by outweighing the towels! Photo courtesy of Within Design. Artwork on the wall is a great way to add a contrasting shade. Photo courtesy of Theo Flamenbaum Interiors. A great way to add green! Transform your interior with bright furniture. Photo courtesy of Artistic Designs for Living. Don't like the green floor? Make the ceiling green! Photo courtesy of Mona Ives. 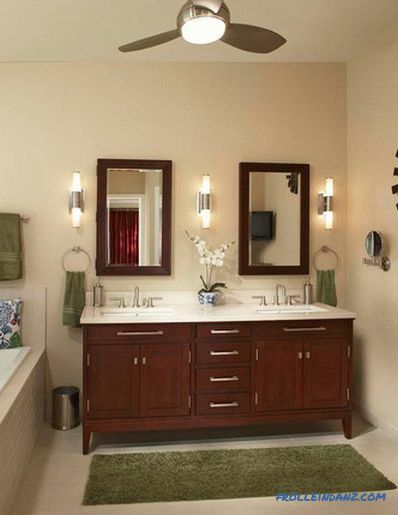 Towels and a rug are the easiest way to add green accents to the bathroom in muted colors. Photo courtesy of USI Design. Remodeling.